I have a Mac Mini server running the latest version of Mavericks and server app version 3.2.1. When I first signed up for AT&T U-verse I had a 2Wire 3801HGV modem. I was able to set up web hosting using the server app and Phusion Passenger for my Ruby on Rails applications running Lion Server. Even upgrades to Mountain Lion and Mavericks did not mess up anything. Everything worked as before. A few months ago all my U-verse services quit working well. The wiring was updated to CAT-50. My modem was changed to the Motorola (Arris) NVG589. Now web browsing is slow at best and my web hosting no longer works. Either my websites do not display at all or they display with no images. I assume the DNS is set up properly for the web hosting because the correct websites show up. I did a clean install of Mavericks and put the same DNS settings as I had when everything was working. I also did a Server Hardware Test just in case something was wrong with my hardware, especially the memory. No problems with the hardware were found. I came to the conclusion the problem is with the NVG589 modem. I did some web searching on the AT&T site and others and found that the problems I describe occur with the NVG510 and the NVG589 because of a known software bug where the DNS check times out really quick before most websites can display. The only option I have (I guess) is to make my Time Capsule the main router. I found a solution in several places, including the AT&T forum. It was suggested that if the Device IPv4 Address is the same subnet as my personal router's LAN segment that I should change the subnet on my personal router (aka Time Capsule) to something like 192.168.10.0. How can I change this number in Airport Utility (or some other tool)? I could not find a way to do this. The steps also say to disable the section on the NVG589 where I opened ports 80 & 443. I know that theses ports are already open on my Mac Mini server. How do I open them on the Time Capsule? Right now I am in bridge mode at the advice of an Apple specialist while trying to solve another problem long ago. When I change the router mode of the Time Capsule to DHCP will I be able to open ports using Airport Utility (or some other tool)? If I cannot resolve this I have lost my development server where I need to be able to test my websites assigned to a domain before deploying to my production server. I checked the AT&T website and the only modem mentioned for AT&T U-verse is another modem that looks similar to the one I have. Maybe it will work but I just wonder. 1) What you're looking for is if the public (WAN) side of the network is using their own DHCP-allocated address pool for the network branch your area is provisioned with. This would be IP addresses that start with 10.x, 192.x or 172.x. These are the same IP ranges typically used for LAN addresses issued by DHCP servers on internal networks. The instruction is to use one of those address ranges that does not match that of the WAN side of the AT&T modem. So let's say that your modem has a 192.x.x.x WAN address: set your Time Capsule to use the 10.x.x.x address range in its DHCP settings. This will prevent matching and conflicting IP addresses as packets are transferred through the modem, as the modem is performing a basic NAT function in relaying the packets. 2) Yes, you need to disable any of the port forwarding done on the NVG589 since all the packets will now need to be handled by the Time Capsule. @colomb's answer shows the configuration section of the Airport Utility where you would need to set up the new port forwarding rules, as well as what mode to operate the Time Capsule in. The "Network Options" button at the bottom of his screenshot is where you will set the DHCP address range for the Time Capsule as well as enabling the NAT Port Mapping Protocol. The end result of all of this is that the NVG589 will now effectively be just a modem for the AT&T service and your Time Capsule will be your router and DHCP server with your port forwarding configuration. Do you know if it's possible to put the U-Verse box into bridge mode? That's the customary approach for using Time Capsule as router. If you can do that, you'd attach the U-Verse box to the WAN port on the TC, and set the Internet tab on the TC to DHCP. If no bridge mode, it's tricky, since you don't want to be doing Double-NAT. 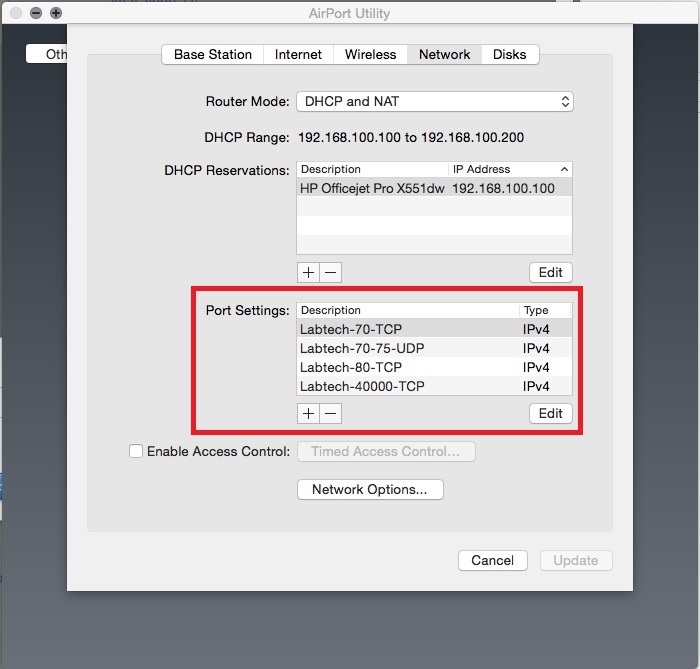 If you can get 1. above sorted, you can set up inbound port forwarding in Airport Utility, in the Port Settings of the Network tab. This may be invisible to you if your TC is in Bridge mode at the moment, but it can definitely be done. Not the answer you're looking for? Browse other questions tagged mavericks network airport time-capsule att . Connecting Time Capsule (or AEBS) to a AT&T U-verse Router/Modem - Proper Settings and Setup? Can Time Capsule/Airport (4th gen) serve local DNS?